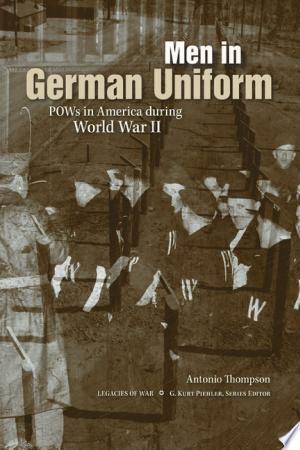 Examining the largest prisoner-of-war handling operation in U.S. history, this book offers a meticulous account of the myriad problems—as well as the impressive successes—that came with housing 371,000 German POWs on American soil during World War II. Antonio Thompson draws on extensive archival research to probe the various ways in which the U.S. government strove to comply with the Geneva Convention’s mandate that enemy prisoners be moved from the war zone and given food, shelter, and clothing equal to that provided for American soldiers. While the prisoners became a ready source of manpower for the labor-starved American home front and received small wages in return, their stay in the United States generated more than a few difficulties, which included not only daunting logistics but also violence within the camps. Such violence was often blamed on Nazi influence and control; however, as Thompson points out, only a few of the prisoners were actually Nazis. Because the Germans had cobbled together military forces that included convicts, their own POWs, volunteers from neutral nations, and conscripts from occupied countries, the bonds that held these soldiers together amid the pressures of combat dissolved once they were placed behind barbed wire. When these “men in German uniform,” who were not always Germans, donned POW garb, their former social, racial, religious, and ethnic tensions quickly reemerged. To counter such troubles, American authorities organized various activities—including sports, arts, education, and religion—within the POW camps; some prisoners even participated in an illegal denazification program created by the U.S. government. Despite the problems, Thompson argues, the POW-housing program proved largely successful, as Americans maintained their reputation for fairness and humane treatment during a time of widespread turmoil. Antonio Thompson is an assistant professor of history at Austin Peay State University and the author of German Jackboots on Kentucky Bluegrass: Housing German Prisoners of War in Kentucky, 1942–1946. He has also taught at the U.S. Military Academy at West Point.